Yamaha have had a long-standing background of providing quality acoustic instruments. 125 years in the music business has given them a reputation of producing high quality digital pianos and keyboards. They may not have produced the first digital instruments but their entry into the digital piano market has always been met with favorable reviews. 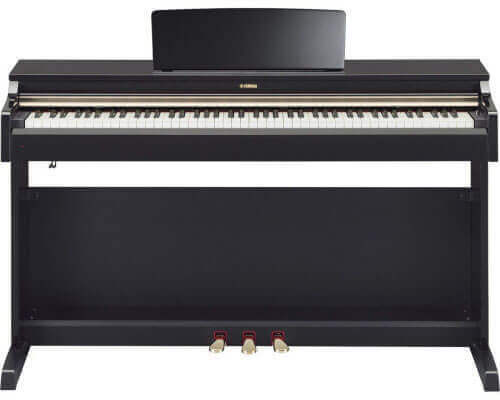 Presently their keyboard ranges are split into the cheaper Arius range and the more expensive Clavinova series which generally offers a greater range of features. The Arius YDP-162 is the mid-priced version of their latest offerings in the Arius range. It is a stylish looking instrument that offers a few well-chosen features and a really good sound and feel. Yamaha have yet again produced a quality instrument with excellent sound reproduction. It exceeds the expectations of users familiar with Yamaha’s already stringent quality controls and sets a new standard in digital sound and touch realism. The Arius provides a digital piano solution for users needing a true-to-life sound and feel. Yamaha have used the sampling of a CFIIIS concert grand, making the instrument sound realistic and full. The CFIIIS is a top performer amongst concert grand pianos and has a bright crisp quality to its sound. There is a high level of accuracy in the sound production across the range of the keys. The 20W speakers per channel also give a dynamic range of volume and clarity to the sound, allowing for the full-bodied dynamic response of a grand being played with vigor. Yamaha have improved their sampling technology, to create the rich sound of a concert grand. Nine other realistic tones include those of the harpsichord, electric piano and strings amongst others. These sounds are also richly complex tones with realistic responses across the range of the keyboard and offer a deeply resonant, clear tone. The instrument offers a deeply satisfying sound while being played and easily fills the space in a reasonably sized room. The instrument sound remained suitably accurate and complex over the range of volume settings. 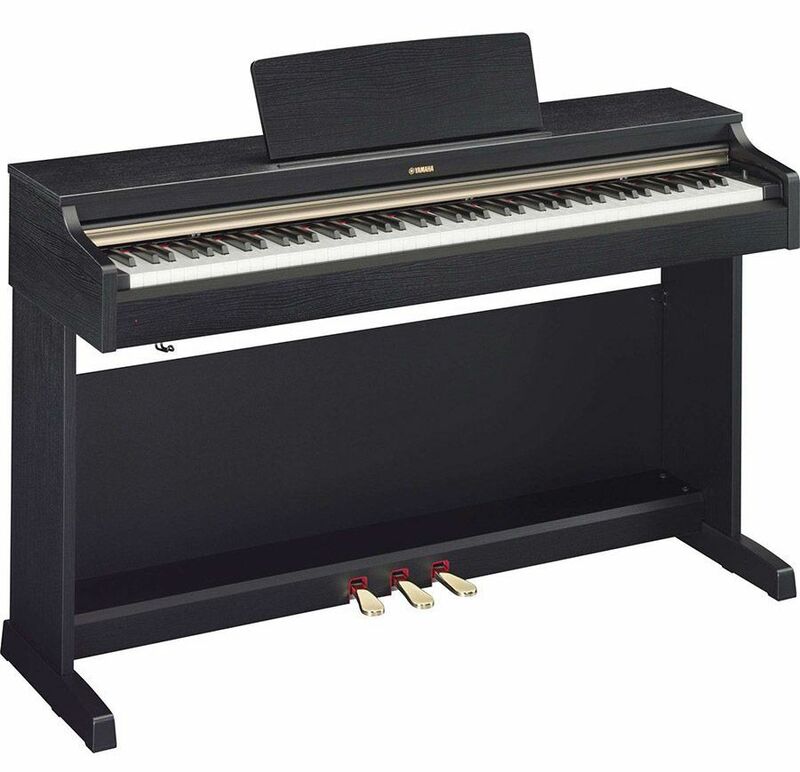 The instrument offers a graded hammer action but adds to the authenticity with a synthetic ivory coating on the keys. This gives an exceptionally natural touch to the instrument and makes it one of the best digital pianos with weighted keys. The keys respond well to the instrumentalist and albeit a little on the lighter side, as is so typical of many of Yamaha’s digital (and acoustic) instruments, still makes for an exceptionally well rounded feel to the instrument and an absolute pleasure to play on. The lighter touch is especially good for younger pianists or those who find that heavier instruments cause them discomfort when playing. The keys respond quickly to being played and will meet the demands of even the most advanced players. Keys are well graded from the heavier bass notes to the lighter upper end of the treble range. Together with the three pedals like that of a grand piano, Yamaha have created a look and feel that responds almost exactly like that of an expensive acoustic option. Halfpedalling is dynamic and accurate and makes for excellent responses while playing advanced piano works. While not offering a large range of features, Yamaha have opted for the more useful features in digital instruments. An almost standard feature on many instruments these days – Yamaha has included a variable setting for touch sensitivity. This allows one to set the instrument to respond in a way that suits your playing style. The reverb effect gives a range of reverb effects that offer some useful modification of the sound. It gives the instrument a range of sounds that make it sound like it is being played in a much larger venue. Dual and Layer functions as well as a keyboard split make better use of the various voices available and allow for some creative expression. There is also a record function for one song that can accommodate two tracks and the instrument offers ten songs on the demo. The ten songs are assigned to each of the different tones of the instrument. A metronome on board keeps tempo but does not differentiate beats. There is also a transpose function. Two headphone sockets are available and a headphone rest is provided. Included in the price is a bench, music stand and music book with 50 top piano repertoire favorites. Essentially it is the sound and feel of this instrument that sets it apart from other digital pianos in the under $1500 price range. For connoisseurs of realistic sound, the instrument offers a very pleasing piano sound that delivers satisfaction from the lowest to the highest note. The added tones are a bonus but even if only the piano sound was available it would be worth buying. The pedalling options offers a great half pedal feel and the digitized pedal effect allows for a range of expression not often created for digital instruments. My favorite feature is the synthetic ivory keys that feel like authentic piano keys and are definitely going to set a new standard in realistic touch for digital instruments. For those with a tactile defensiveness to plastic keys, users would be hard-pressed to tell the difference between the keys of the YDP-162 and real ivory coated keys. The rest of the instrument has a well-manufactured rosewood finish and presents a stylish instrument that adds class to any location. The three-pedal system offers great versatility in pedalling options and mimics a real grand very accurately. Pedalling of the most advanced works is easily executed. The instrument offers 128-note polyphony and as such the drop off of sustained notes is minimal when one tone is used. When the layering function is being used the instrument can experience some loss of sustained notes if long sustained passages are played or tremolo effects are employed. The touch setting offers some customisation of the feel of the keyboard, allowing users to tailor the touch response of the keyboard for lighter to heavier playing styles. Two headphone jacks offer a listening facility to a teacher and student at the same time, making it a useful option in noisy environments or where the users may disturb others while playing. A sliding cover offers dust protection and adds a quality look to the instrument when not in use. There is very little wrong with this instrument. Some may find the softer touch a little too light for their taste and even the adjustment settings don’t make a huge difference to the touch settings. The limited number of tones and preset effects may also be too limiting for some users who like to set their instrument to settings that offer just the right sound and feel. The layering option doesn’t allow for an individual setting of volume and consequently it feels as if one instrument can overpower the other or the two instruments tend to lack distinction if there sounds are similar. The halfway splitting of the keyboard into two identical keyboards seems a waste as only basic pieces can be used in a duet situation and unless one is teaching a large number of beginners, it’s a feature that frankly defies much practical usage. The cons are predominantly cosmetic and reflect the need to choose an alternative instrument if more features and modifications are required. What this instrument promises to deliver it does deliver and, while not offering all the bells and whistles, as a simple instrument it is a neatly packaged, high quality instrument. At a reasonable price, this is a quality instrument that delivers excellent responses and will give many hours of satisfaction to users. It is a delight to play on and sets a demanding standard for accurate sound and touch realism. It comes highly recommended to those who are looking for authenticity in their choice of instrument and who need to deliver a high level of sensitive expression in their performances. The instrument makes for excellent home use and is stylish enough to command a prominent position in the home. Yamaha have invested the cost of the instrument into the areas that matter – a great touch and a great sound.